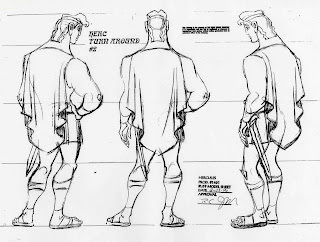 Barry Johnson, a very talented story artist who I worked with on a few projects, posted this partial rough model sheet on his blog recently. 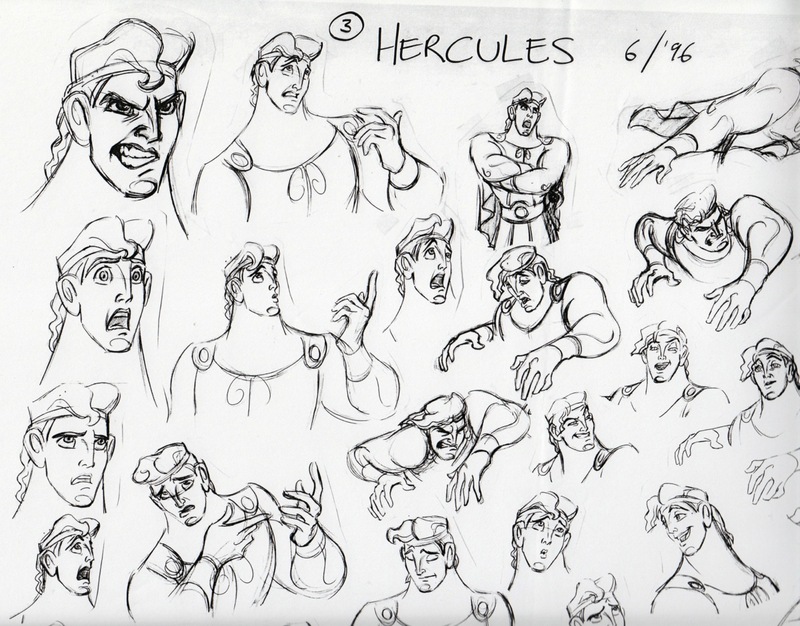 I had forgotten about it, but it reminded me to do a post on Hercules. 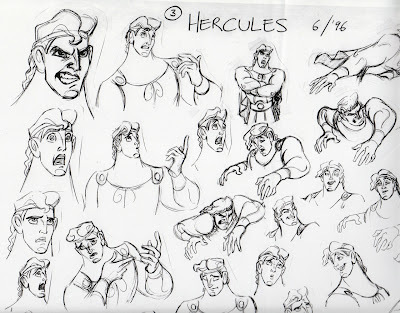 I animated adult Hercules in the movie, and the assignment was a shift from my previous characters Gaston, Jafar and Scar, all villains. I wanted to do a different character concept this time around, so I asked if I could do the title character. 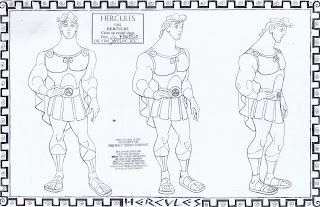 Even though the film's cast was going to be inspired by the graphic style of British artist Gerald Scarfe, I knew that Hercules needed to be animated subtly and convincingly. 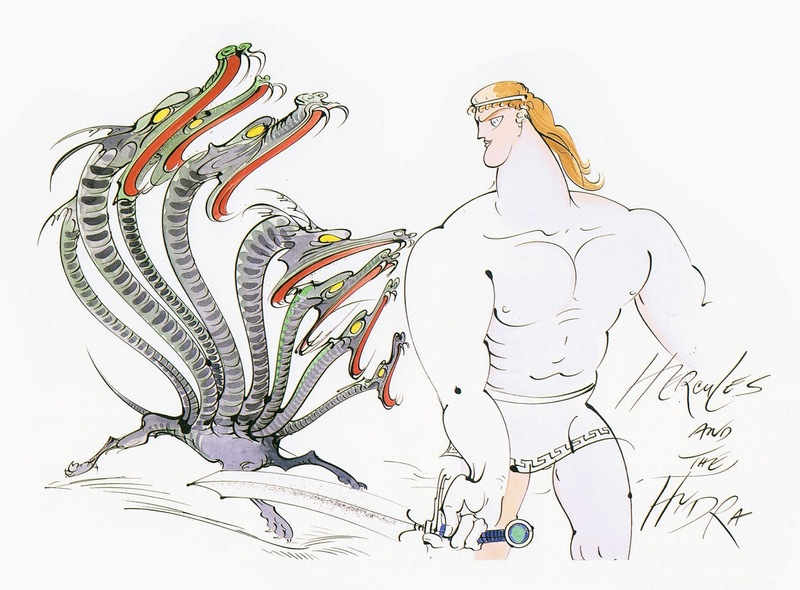 As a matter of fact, Gerald Scarfe drew him in a very exaggerated way and told me:" I just don't draw Hercules the way he needs to look in the movie." 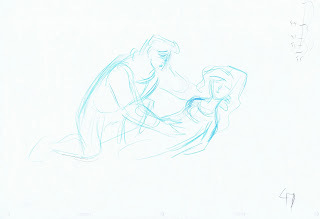 Still, a very cool sketch. 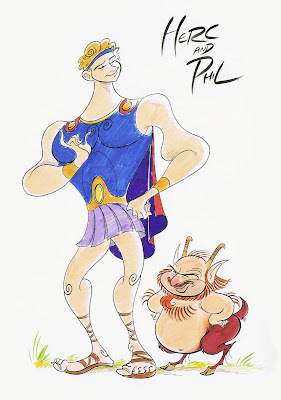 Eventually Gerald and I got together to discuss design issues. 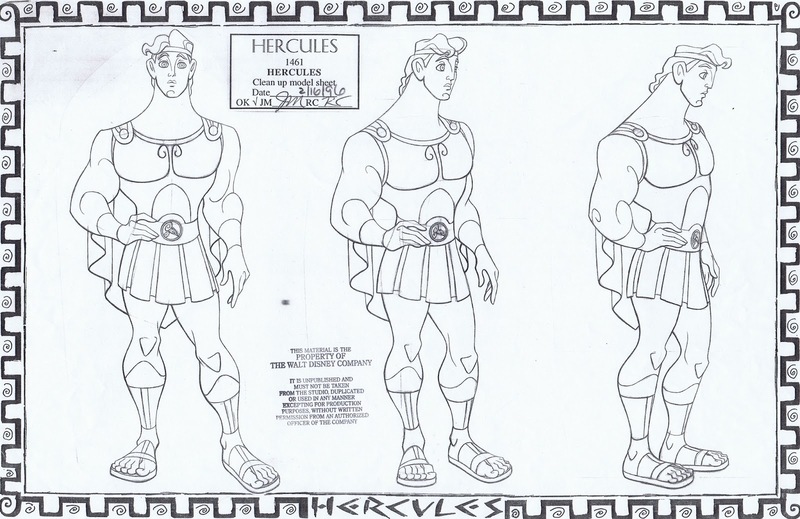 All the other units had pretty much finalized their characters, and it was time to nail the appearance of Hercules. 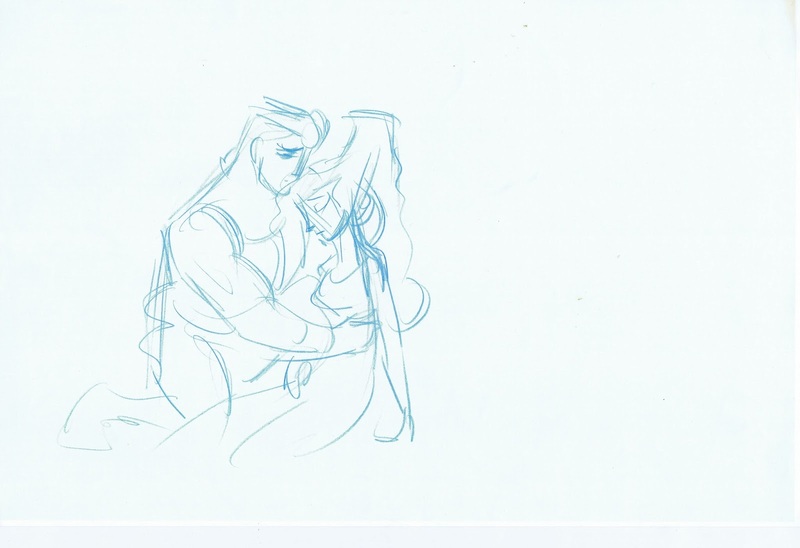 So we both talked and doodled at the same time until we quickly came up with this sketch. 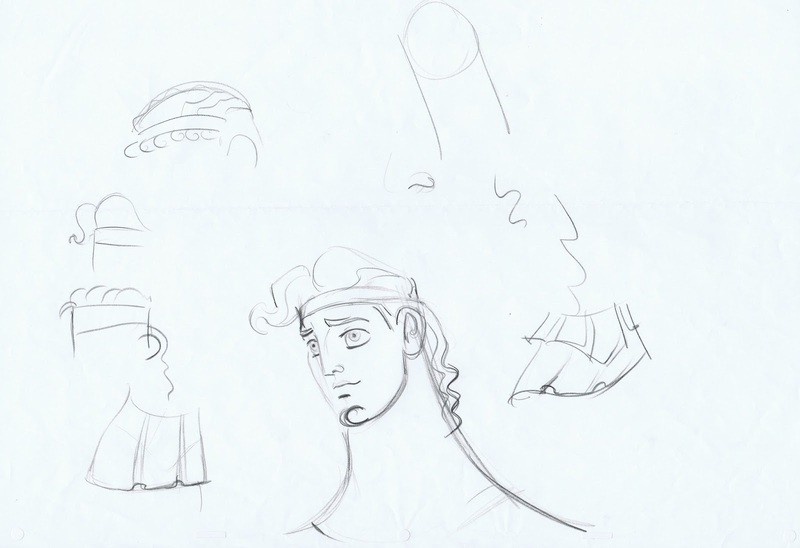 The main idea was to go back to images of Greek sculptures, athletes or Gods, and incorporate some of the facial features into our design. 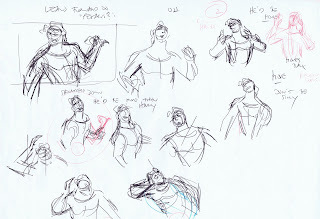 Still looking for the right shapes and forms. Thumbnail sketches for my first production scene. Herc has just offered Meg a ride on Pegasus, and confirms that the horse wouldn't mind. Then from up above an apple hits Herc on the head. 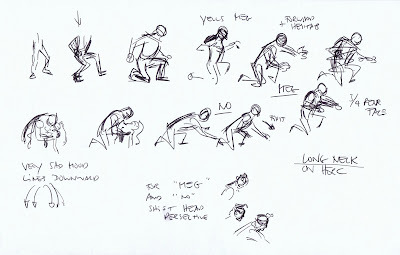 These sketches were made in front of a TV set, I was studying life action reference by actor Robert Gant, who gave me great ideas for acting. 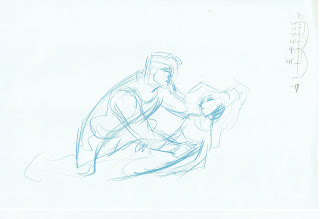 More thumbnails for a scene, late in the film. Megara has died, and Hercules rushes into frame and in disbelief picks up her body. 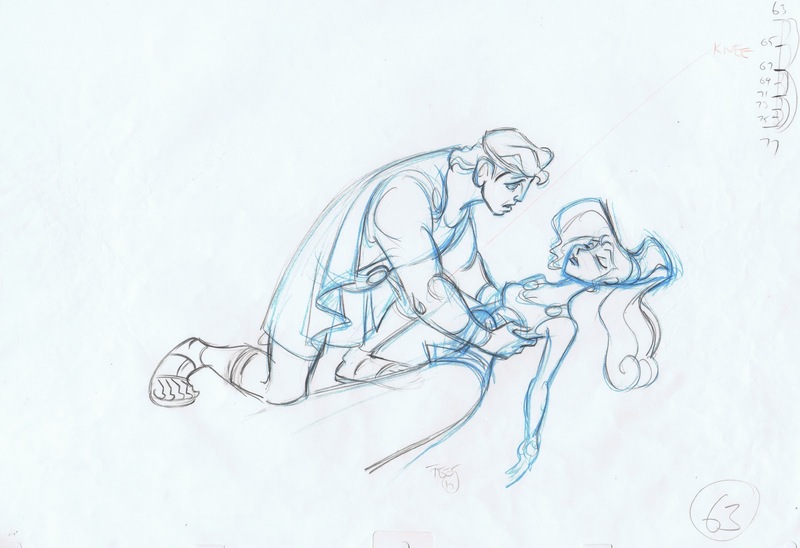 A couple scenes later he lowers Meg slowly to the ground. 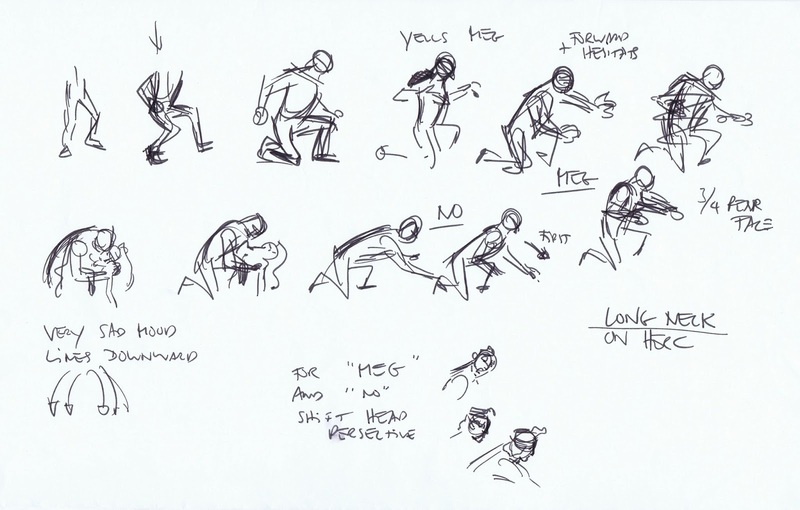 These poses are my first rough pass, the last image is tied down. Animator Ken Duncan, who supervised Meg, helped me to keep her drawing on model. Turn around sheets in clean up and rough form. 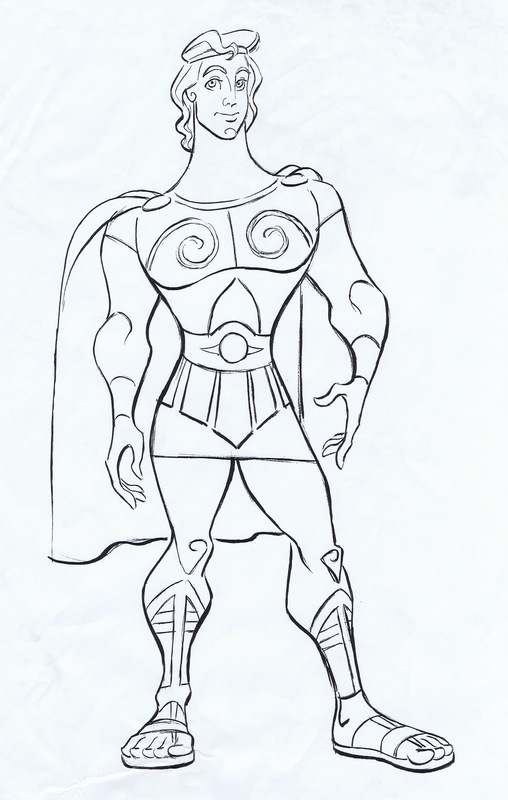 As you can see, there is quite a bit of line mileage on this character. 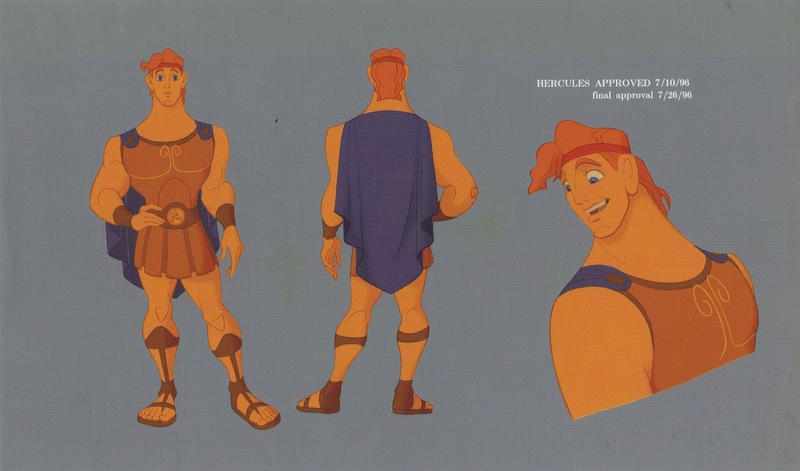 I have to say I really enjoyed animating Hercules. Tate Donavon's great voice performance had a mix of innocence and awkwardness, but also bravery. 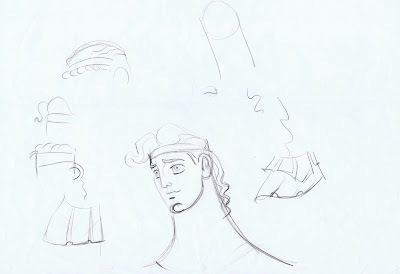 After a few scenes under my belt Herc also became a lot of fun to draw. 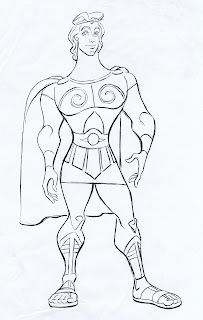 The design was stylized, but he needed to move with weight and subtlety. 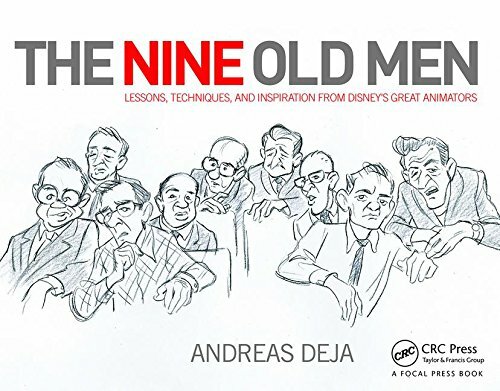 There are plenty of scenes I'd like to do over again, but I look back with fond memories of how much fun we all had creating these characters. 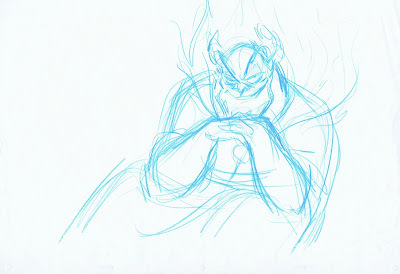 By the way, initially I was asked to animate the villain Hades. 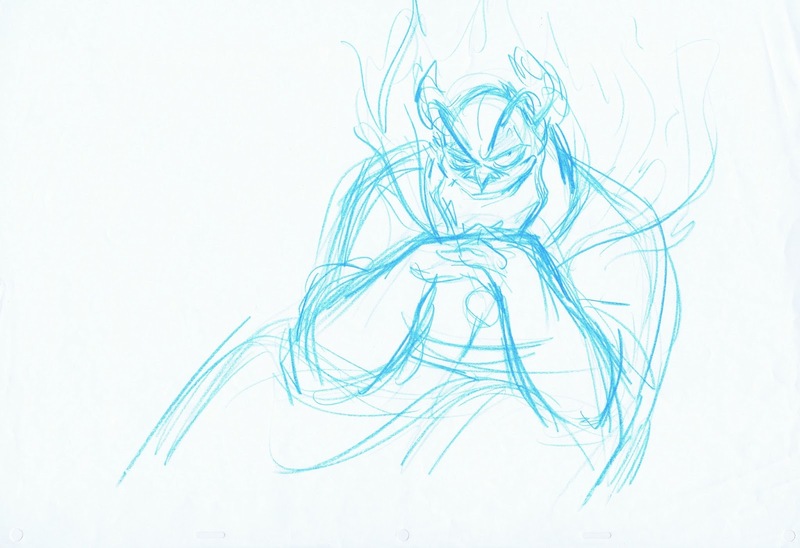 At that time he was thought of as a Jack Nicholson type. 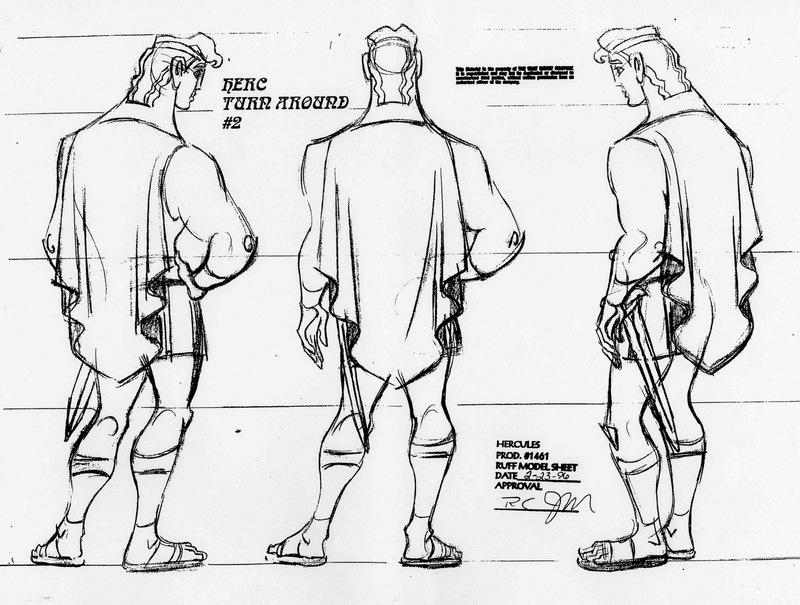 I am glad Nik Ranieri ended up doing this character, he did a splendid job with him. A fun caricature by Eric Goldberg of me as Hercules and Eric as Phil.